I feel like I'm trotting out my worst personality flaw in this post. Anyway, this will be part confessional, part renovation post. And if my brothers and sisters in home ownership can offer me any absolution, please do. When I start thinking about what I want to do to my house, I think a long time. A long, long time. Because I am afraid of making mistakes, or getting half-way through something and changing my mind. Then I daydream and scheme. Also, a long long time. Because that's the most enjoyable part. And I don't have to buy anything, demolish anything, get sweaty, angry, or discouraged. It's all magic and glitter and marble countertops and done-ness. Can we hear it for DONE? That's what gets me started. That's what gets me to the local hardware store, list in hand. And then real life happens. Because man, this home renovation thing is UGLY. It takes forever. It's always twice, three times, four times more expensive than I thought. 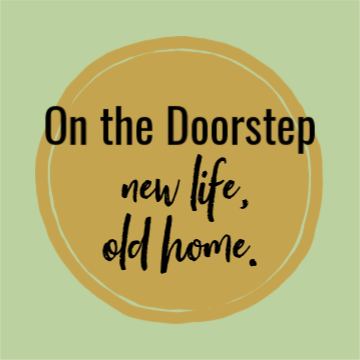 There's always some snag in the renovation that I can't think or spend my way around, and I stop, get discouraged, rooms languish, and I find myself living with unfinished projects for an indefinite period of time. It's about then I begin to think my faith in this one thing, this relationship with this one old home, is completely superficial, and that I'd be better off in an apartment, a new condo, ANY place where I could just drink coffee from my sofa and call the landlord when I was displeased. Maybe buy some new toss pillows. Luxurious yawn. Sigh. Right here, everyone, is where I start this process yet again. With the upstairs bathroom. At least we start with the ugly part, up front and in your face. My house is a one-and-a-half story Cape Cod colonial, so the upstairs rooms are low ceilinged. 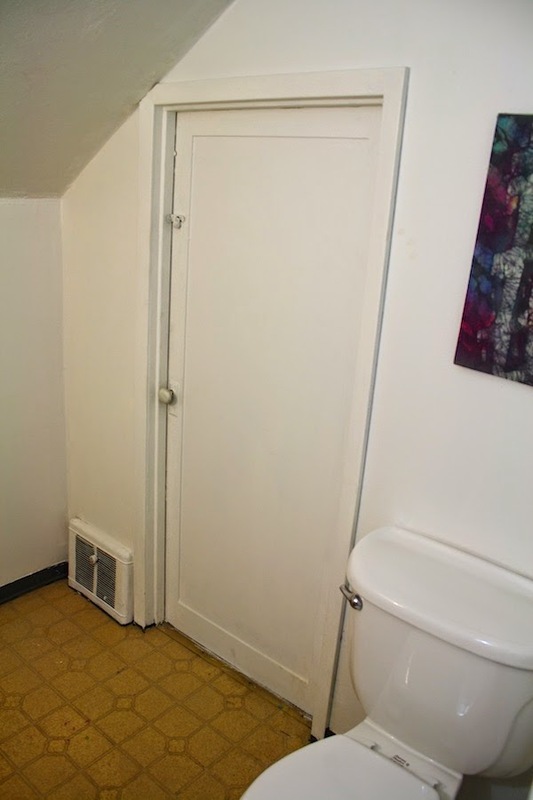 There was no bathroom up here to begin with, but sometime (I think the late 1960s) someone carved out space in one of the two bedrooms for a very small and awkwardly-shaped 3/4 bath. That is the view from the upstairs hallway. Inspiring, isn't it? 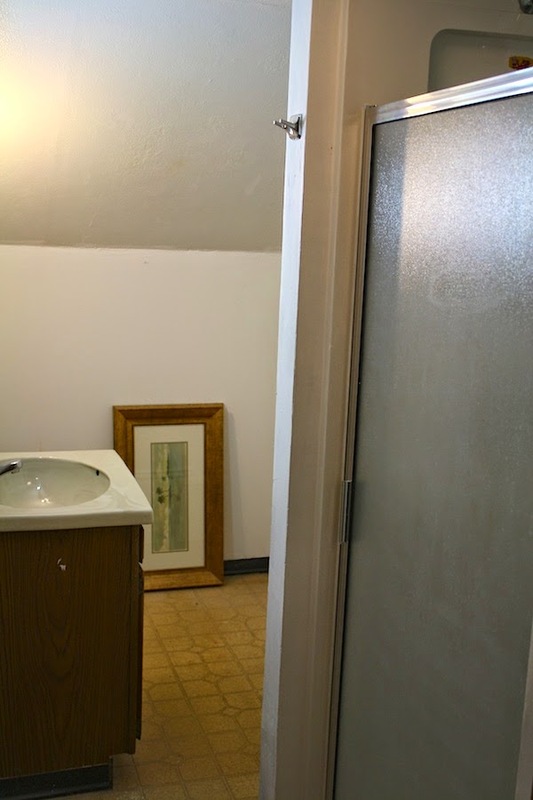 You can see the shower stall to the right, and the sink vanity, further into the room, on the left. The toilet is hidden in this photo, on the other side of the wall from the shower. The roofline is sloped up from the back of the bathroom. Let's step further into this charmer, shall we? To the left, the sink top may actually not be that bad, if the right colors were with it and it was updated with a new faucet. But it's sitting atop a vanity that may possibly be made of pressed cardboard or something similar in quality. On the right, we have the door to a side attic, and the toilet. People who are on my personal Facebook account know I spent a very, VERY unpleasant day a few weekends ago thoroughly cleaning the toilet, inside and out, and replacing the seat. It's in much better shape now, but I was very close to the point of either trying to sterilize it with a flame thrower, or having it replaced. And the end of the bathroom opposite the door. There's actually quite a bit of floor space here, but it's under the roof slope. It makes the layout rather cramped in the total perspective of the room, but also odd. Notice the black vinyl baseboard slopped with white paint. Awesome. The spots on the floor are also paint splotches of various colors, mostly teal and salmon pink. 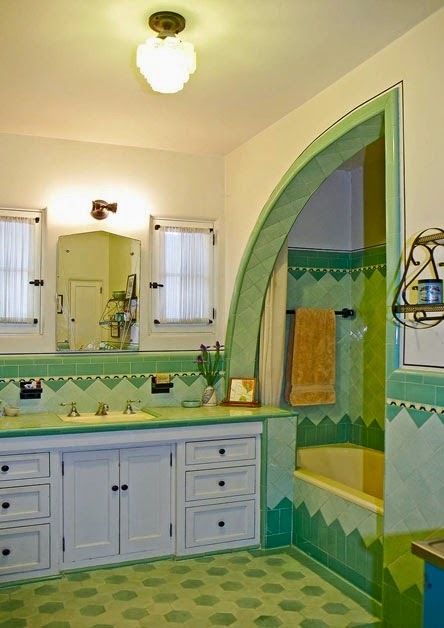 There's been approximately 1500 towel bars hung in this bathroom over the course of its history. And the mounting holes from them have all been repaired, exactly like this. 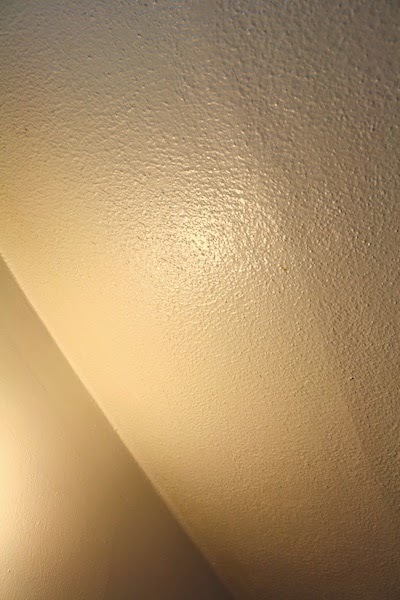 Super shiny paint. With low ceilings and grubby surfaces, the only thing one could do to make it worse is to paint it all (sloppily) in high gloss paint, so the whole thing is bathed in an oily, lurid glow. Now that I've introduced you to the challenge, some considerations. 1. My excuse for starting this project is the renovation of my bedroom, ongoing right next door to the bathroom. There's a relation between the two which I will explain further in a future post. But it makes sense that some of the work needed to these two rooms comes along at the same time. 2. I have maybe a $200 to budget for this room. That's not a lot; in fact it's practically nothing. What happens in this room is going to be mostly cosmetic. 3. 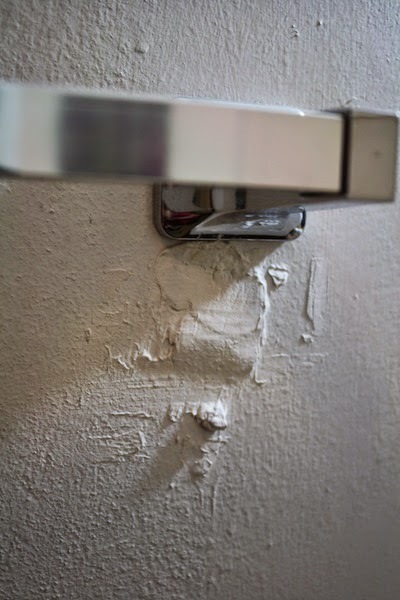 I've already started in small ways-- deep-cleaning the toilet and replacing the seat, tearing out all the towel bars and vinyl baseboard, sanding and repairing the walls. 4. My goal is to make this bathroom something we can live with in the meantime. Because larger chunks of the budget are going to have to go, by necessity, to the downstairs bathroom. There. I have officially started yet Another Mess. I'll talk more about Finishing Ones I've Already Started soon. Soon. Sigh. I see a WHOLE lot of promise in this bathroom. I hope you don't mind a suggestion. That tiny vanity, perched in the center of that wall, appears to create a pinch point with the corner of the shower. What are the chances of getting one that's larger (ReStore), and scooting it farther into the bathroom along that wall? You said that the ceiling slopes there, but I can't see it in your photos. 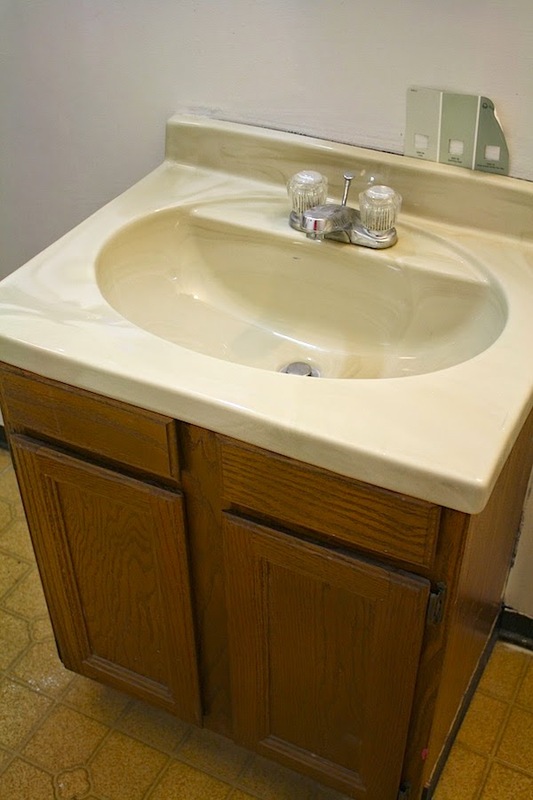 Imagine a 36" vanity with a sink top that has the sink skewed to the left where you can stand, with more counterspace to the right where the ceiling slope is. Does this make sense? 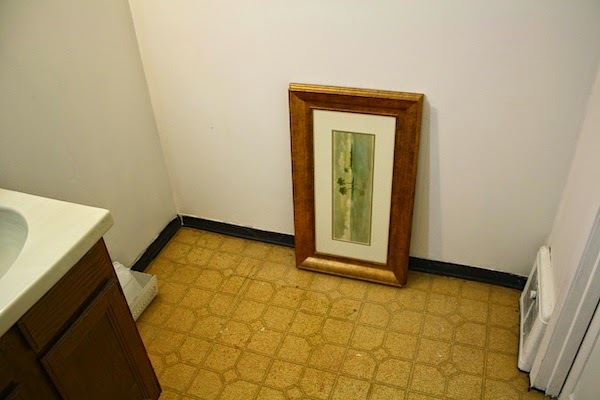 Along with this and wall repair and paint, you could even prime and paint the floor into some faux tile pattern, and be well under your $200 budget. I can't figure out the floor plan, so I'll make no suggestions about that. That sink is remarkably like the sink in my downstairs bathroom, up to and including the exact faucet :-) which is impossible to clean the town water additive deposits off. However, I do like the sink countertop shape, very interesting. 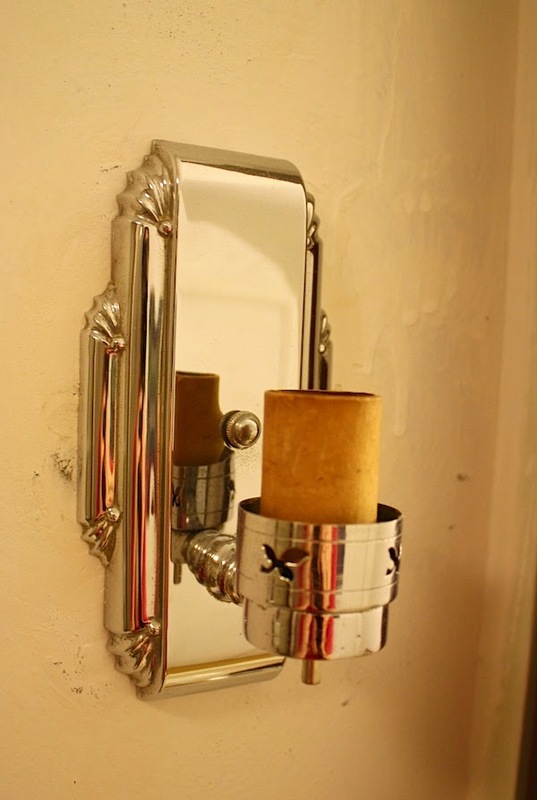 Those sconces - almost, no, assuredly, they make everything else worthwhile. How did they happen, I wonder? You can't possibly be a slower fixer upper than I am. I'm at year 10, no 11, with some projects not completed. Karen Anne--I can't believe I didn't include this in the post, but the sconces were put in there by me. I couldn't STAND the ugly ones that were in there before, and I just decided to pop these in. I'd hauled them around a long time because I loved them and wanted to find a place for them. So they became the beginning of this bathroom! I think a lot of us old house folks have that personality flaw--I know I sure do! I have unfinished projects that have been that way for years, and some of that is because I'm overwhelmed at the cost and the logistics of it. Those sconces are beautiful! I see a lot of potential with the room. Hang in there--what you've done so far with the house is great, and this will be too. Sorry I missed this when first published (I've been missing lots of things lately) but want to let you know: I hear ya. On all of it. We've got a moratorium on ripping up/out anything new until we fix all the things we've already ripped up/out (including stairs torn apart THREE years ago). I, too, entertain thoughts about apartments and new construction. 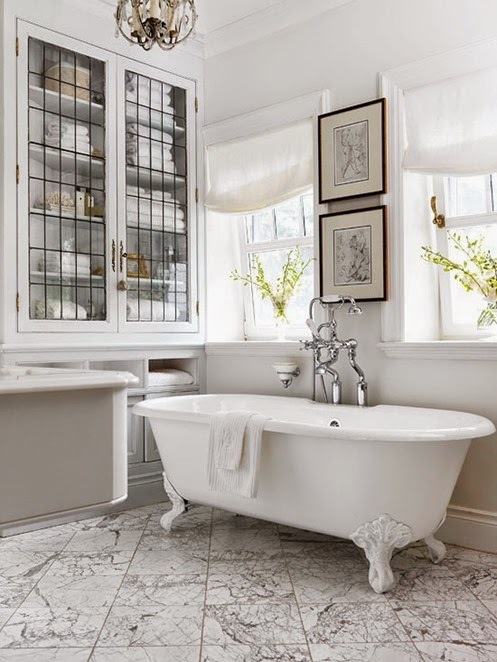 As for your bathroom, have you considered a pedestal sink? Perhaps you could put some kind of storage in that open space below the low ceiling to house whatever is now in the vanity? And I second the ReStore idea. We were able to re-do a bathroom on a budget using a similar source. Old/new vanities are much less expensive (and nicer) than the ones you can find at Home Depot. Good luck--looking forward to seeing what you come up with!